Noises Off: The electronic tuning system at Carmel's Sunset Center hasn't generated anything since July--except controversy. Music hath charms to enflame the savage breast. Just ask the classical presenters who have used Carmel's Sunset Center since its much-ballyhooed renovation. Since last July when the Carmel Bach Festival inaugurated the dramatically transformed hall, divided opinions have stacked up like commuter traffic on the glutted Highway 68 corridor. For the uninitiated in Santa Cruz County, it should be noted that while most of Carmel is under county jurisdiction, the 1-square-mile incorporated Carmel-by-the-Sea remains the focal point for music on the Monterey Peninsula. The Sunset Center, in particular, is the venue of choice for classical music here. But the noticeably improved acoustics of the new Sunset Theater have set off a rumble with discord from several quarters. Much of the suspicion focuses on the electronic system that was installed to provide acoustic enhancement in a space that lacked sufficient volume to perform that crucial service for the performance of live music. The LARES system (short for Lexicon Acoustic Reinforcement and Enhancement System) was chosen for its capacity to extend the natural fade time of music without coloring the direct sound from the stage. Forced by its performance calendar to deal with the issue immediately, the Bach Festival's managing director Willem Wijnbergen pushed to "tune" and use the LARES system, even over the objections of music director Bruno Weil. In the last-minute run-up to opening night, Weil became so impressed by LARES that, according to Wijnbergen, he called it a "no-brainer." The loudest complaints, however, were from a few patrons who said the fade time was too long, that it made the 700-seat Sunset sound like "the Grand Canyon," resulting in a disconcerting discrepancy between what the ear heard and what the eye saw. Despite these criticisms, the hall made a generally favorable impression. The Bach musicians seemed mostly pleased with the enhancements--not only could they hear themselves with unprecedented ease, but every little detail in the room as well. So could the audience; however, as it soon became clear, that included heavy breathing, coughs, rustled program pages and even whispered conversations. To some, this soon entered the category of too much information. Exacerbating the unease among presenters was the implied promise that LARES could be tuned to accommodate the particular demands of each performer, from solo musician to full orchestra, from lecturer to theatrical production. When Steve Barbar, the LARES principal and the only one who could tune each setting, delivered what the Bach Festival decided was best, he tried to return to his Massachusetts office, only to be stopped at the airport and returned to Sunset for 10 more days of adjustments. The city of Carmel picked up the tab of $10,000 for those 10 days, according to Carmel Mayor Sue McCloud. Meanwhile, the idea of creating a separate entity to run Sunset Center had surfaced in a report by an independent consultant commissioned to analyze and make recommendations on the management of the facility. As a result, a 35-year veteran of administering complex cultural facilities, Tom Bacchetti, was installed as interim director of Sunset. According to Bacchetti, the City Council formally took steps to negotiate an arrangement between the city and the newly hatched nonprofit, Sunset Cultural Center Inc., during its October meeting. To date, none of the classical presenters has chosen to use any of the few LARES settings that were made available during last July's Bach Festival. Instead, these users are making do with the bright but dry natural acoustics of Sunset Theater. Amy Anderson, president of Chamber Music Monterey Bay, puts it this way: "Yes, a subtle and sensitive setting of the LARES would be very welcome by all the chamber presenters, and possibly by the symphony as well. The only setting that has been established thus far, for the Bach Festival, is so 'false' sounding--with way too much reverb--that none of us want to use it." The Monterey Symphony, Mozart Society, Chamber Music Monterey Bay and Carmel Music Society--all of whom used other venues during the two-year renovation--are unanimous on this point. (The latter, hosting the Prague Chamber Orchestra, used LARES for half a concert, then switched it off .) All had high expectations, spurred by various meetings called by Sunset Center during the past several years, and, not least, by the touted and costly (roughly $300,000) LARES system. Using Sunset for the first time, Ensemble Monterey and Youth Music Monterey likewise opted for no LARES enhancement. According to Barbar, if Sunset were dedicated only to live acoustic music, instead of multiple uses, tuning for the hall would be simpler than tuning for each user. During a phone conversation, he described a 400-seat auditorium in the Boston area whose tuning was satisfactory to most presenters of classical music, whether for large or small forces. That suggests something similar might work for Sunset's music users. But, he adds, no one from Sunset has called him since last summer. The system has other defenders, as well. Acoustic consultant Dennis Paoletti, of Shen, Milsom and Wilke, who came on board after it became clear that the roofline of the building would not be permitted to go any higher than the original, asserted that acoustic enhancement was the only realistic way to achieve the desired sound of live music in the room. LARES was one of several systems he recommended. "We talked to every potential user," he says. "Normally, however, we would focus in on a few common settings. The Bach setting is kind of extreme." 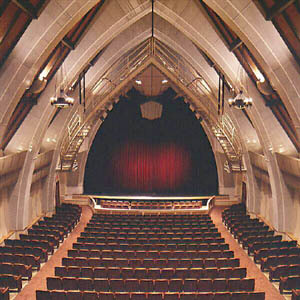 Paoletti also noted that the Monterey Symphony was the only presenter so far that had conducted physical acoustic experiments, including deploying the acoustically absorbent curtains along the walls intended for use by speakers and theater, and pushing aside the shell at the back of the stage. Symphony executive director Joe Truskot explained that without damping down the raw sound, the strings sounded harsh and edgy. (He also complained that the above-stage mics used by LARES picked up and amplified the noise of the air-conditioners.) Paoletti said he attended the November symphony concert and, from his experience, it "could use LARES to its advantage." It would seem most likely that tuning choices developed during Symphony rehearsals might give Truskot and company what they want, and probably would come closer to satisfying the others. At least a choice of something less that the "Grand Canyon" would give some needed encouragement to the currently frustrated classical presenters. In the meantime, it's a case of "hurry up and wait." As Paoletti puts it: "The city or Sunset Center has to take the lead."